This was a remarkable offering at our recent gourmet club gathering. My, oh, my, what an final course for the evening! Rustic, aromatic, even ‘hefty’ as it arrived at the table. And then… pouring the Butterscotch Sauce over the top was like improving on perfection. Enjoy! Toss bread, melted butter, and 2 Tablespoons sugar in a large bowl and set aside. Using an electric mixer, beat eggs and remaining 1 ½ cups sugar in another large bowl until pale yellow and fluffy, about 3 minutes. Add cream, poppy seeds, and salt; beat to blend. Place bourbon in a small bowl; scrape in seeds from vanilla bean (reserve bean for another use). Whisk to distribute seeds, then add to egg mixture, whisking to blend well. Pour egg mixture over bread mixture in bowl. Add pecans and toss to coat well. Transfer mixture to a 13x9x2″ glass or ceramic baking dish, spreading out in an even layer. Cover with plastic wrap and chill overnight. Preheat oven to 325°F. Remove plastic wrap and bake until top is browned in spots and a tester inserted into center comes out clean, 1 ¼ – 1 ½ hours. 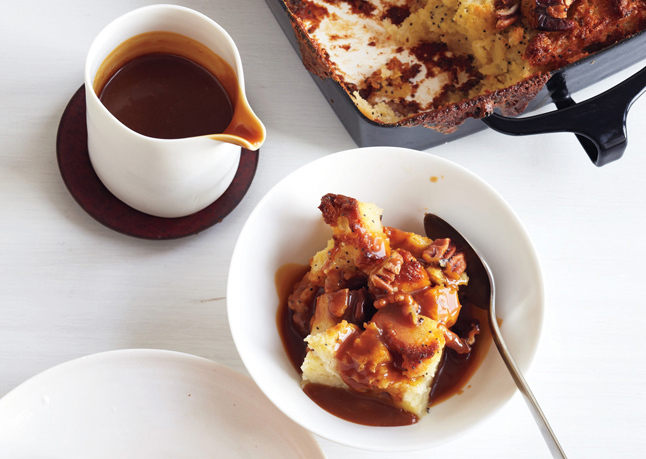 Serve bread pudding with butterscotch sauce.